.LiNK RVC-input for connection of a rear-view camera. Compatible with VW Composition Media (not all models), Discover Media, Discover Pro. Skoda Bolero, Amundsen, Columbus. Seat Mediasystem Plus. Head-unit must be coded with diagnosis computer! Factory OPS must be installed. 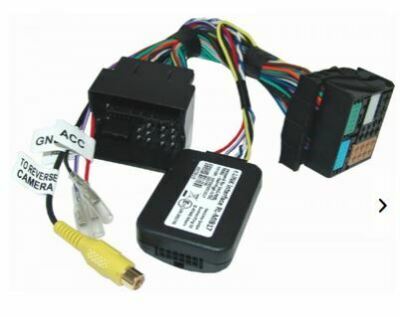 Product information "r.LiNK interface compatible VAG MIB,MIB2 - Std+High-NTSC"
The r.LINK interface allows the connection of rear-view camera to the factory navigation system. 5.8inch, 6.5inch or 8inch monitor. newer versions are likely to not be compatible as well! Only the last 6 digits/numbers are relevant. After-market rear-view camera Compatible only with NTSC cameras. Coding Vehicle must be coded by diagnosis computer to rear-view camera. On some vehicles this is only possible if the vehicle is equipped with a factory optical park distance system with graphical display on the monitor.